I started this blog, Growthtext, as a side project in March of 2016. Every month, I wrote 1-2 blog posts, getting readers to sign up to my list using several lead capture forms I set up. I used it to launch an online course, Rapid 5K Subs. During my 10-days launch, 29 people paid $420 (on average). That gave me total sales of $12,169… all without affiliates or paid advertisement. In this post, I want to show you the exact process I used to launched Rapid 5K Subs list-building course so you can take what you’ve learned from my experience and apply it to your own product launch. #1. This is my part-time, side project activity… blogging on Growthtext, creating my online course, preparing for the launch. I work on the projects when I can find the time. Because I can only squeeze in my side project work between clients, it took me 6 months to complete my course. Had I been able to work on the course full time, it would only have taken me half the time to create it. #2. I launched Rapid 5K Subs as an exclusive to Growthtext email subscribers. No affiliates, no joint venture partners, I didn’t spend a dime on AdWords or Facebook retargeting ads. It was a plain old email thing; just sending emails to my subscribers. On launch day, I had around 6,000 active subscribers on my list. #3. I Didn’t spend money on complicated LMS (learning management system) software or any WordPress membership site plugin. I use Teachable.com to host the course plus process the transactions for me. So aside from the 2% transaction fee Teachable.com charges me, everything is pure profit. Phase 3: Create the course. Let’s look at the phases in details. Here is the problem I see over and over again. People have an idea and then just go build themselves an online course. Then they look for marketing partners (JV manager, big name marketers, big list owners) to promote for them… which rarely success. So there are 2 problems with this approach. Number 1: Good online course promoters are occupied all year round. Even when they have openings, they are picky. A new course creator won’t have the stats to show for that. Number 2: When a course creator relies on another person to promote for him, under normal circumstances the course isn’t going to do very well. When potential buyers have never heard of us, have never read a single article we have published, they can’t judge how good we are in our area of expertise. It’s very hard to convince someone to buy your course simply by reading one piece of a long sales page plus maybe a couple pitch videos…especially in today’s noisy world where self-proclaimed gurus are everywhere. When people can’t tell if we’re the right person to follow, they become mired in indecision and pass on buying. And don’t forget, those course promoters don’t just promote one online course. They pitch multiple products to their audience, over and over again, year in and year out and over time, their audience gets bored. Over time, people don’t place as much value on their “next BIG thing” claims. Though a promoter boasts a 50,000-subscriber list, they may only get 5-10% email open rate. That won’t get you very far. Email readers are now trained to scan thru email promotions. They don’t read stuff in an email… unless it’s from a handful of trusted names. Today, most people open emails from a only handful of “trusted names”, and they almost always open those emails. If you can get into their inner circle, you get undivided attention. Understanding this, instead of heading to make my course first, I chose to build my own audience first, then figure out what my audience will buy and create a course to sell to them. I had started Growthtext 14 months before I launched my course. Since I was not, and still am not, a full time blogger, I didn’t manage to populate Growthtext with lots of content. All I had was 28 blog posts spread across 14 months. That’s an average of 2 post each month. But when I post, I write content that’s really worth my readers’ time. 1. How I built 10,000 visitors to Growthtext in 1 month. 2. How I convinced top social media influencers like Mari Smith and Sam Hurley to share my blog posts with their audience. 3. How I doubled my email open rate and the best time I email Growthtext subscribers. 4. How Chloe Alpert made 5 figures in 3 days selling soaps on Reddit. 5. How Ross Nochumowitz made 6 figures with his “Baltimore In A Box” model. I write about things I love and believe will help my readers… a lot are about real marketing experiments myself and others marketers have taken. After a while, I successfully built an audience of people who regularly read my content when I publish new articles. People started to know me, pay attention to what I have to say, and spread my blog for me. This is the perfect group of people who are willing to listen to me when I have good things to recommend. I wanted to build a course and sell it to Growthtext readers. So, I told myself I’d better spend some effort to find out what people really want to buy before I go make it. First attempt, find a topic people like the most on Growthtext. I logged in to my Analytics account to find out which are the most visited blog posts on Growthtext. If I could identify the most popular topic in my posts, the interest would show a strong indication for the right topic for my course. The bad news was, after going thru my Analytics stats, there was no strong indication. The top 10 most visited blog posts on Growthtext were all on different topics. In my 2nd attempt to find my course topic, I wrote to 50 of my email subscribers. I asked each of them to give me the one area they are struggling with the most, and for which they are desperately seeking a solution. No complicated survey form, I wrote them in plain old email. They could merely hit reply and get back to me. Simple and straightforward. I wanted to build a course for my subscribers, so I figured I’d let them tell me what they want. When I saw my replies, I immediately knew this attempt wouldn’t work. It seems like everyone was at different stage of their marketing and were struggling with different challenges. My readers wanted more about everything from traffic generation to outsourcing guidance and all sorts of other topics in between. I had no idea that Growthtext readers are so diverse. Obviously, I could not make a course that covers that many topics. The majority of Growthtext readers are made up of current marketers and future marketers who are learning the craft. I told myself, why not I spend time finding out what the marketers’ “must have” tools and software are. If a marketer cannot move forward without using a specific tool in their marketing efforts, that subject must be a topic people cannot ignore. And if I know that subject well, there should be a ready market for my course. Then I went through the search results, studying them one by one. There are many tools… Among the tools, there is one that’s nearly always recommended on marketing blogs. Mailchimp is a popular email service provider. 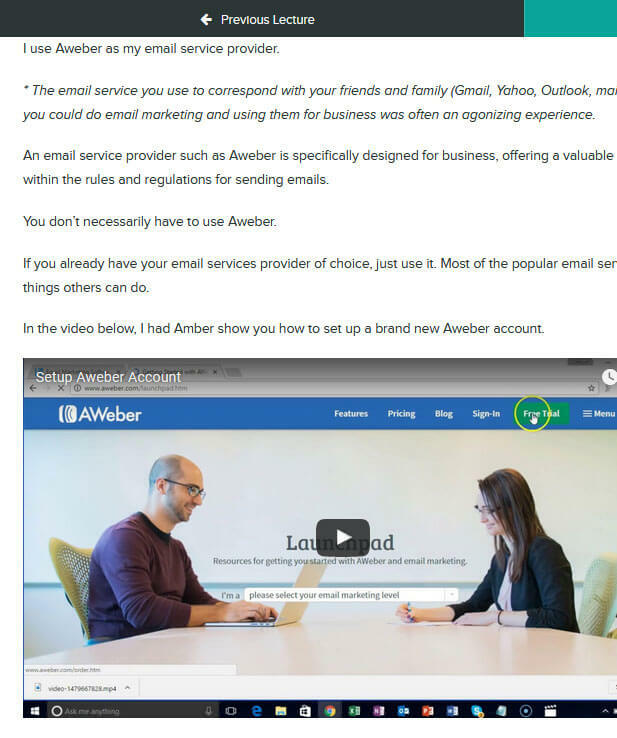 At the time I’m writing this, it is the only email service provider (autoresponder) that allows users to send 12,000 emails each month for free. They only charge users after they cross the 12k /month mark. That’s why many marketers who want to build their list start with them even if it’s not the most versatile email marketing tool out there. Mailchimp is recommended everywhere, which tells me marketers are already aware that that list-building is important for their business. How about I design a course to show people how to build their email list? I shouldn’t go wrong with the topic, I told myself. Every marketer needs to build a list and that’s a topic I’m good at. Since the day I started Growthtext, list building has been one of the 2 most important things I focus on (the other one is traffic generation). Attempt 3: I found my course topic! Once the topic was decided, the next step was to make the course. As I already been building my list from day one of launching Growthtext, I knew my material very well. I didn’t need to do much research to write the course. All I had to do was make a list of the list-building strategies that work for me, and arranged it in a well-structured format… all that was needed was the time to flesh it out. As I mentioned earlier, extra time was always scarce. I had to find time between client projects to write the course. It took me 6 months to complete put it all together. When it comes to list building, most people jump right into little tactics without having a sustainable list growth strategy in place. The truth is, randomly implementing a couple of list building tricks won’t give a marketer a sustainable list growth. They might be able to pick up a couple subscribers from each little trick here and there, but … that’s it. Having a sustainable list growth strategy that is comprised of little tactics all lined up in a sequence to make the overall strategy work is the key to success… and that’s what my course is based upon. In my course, I show students the complete strategy I used to grow my own list from 0 to 5,000 within a few months (not years). I begin my course by taking apart every piece of my system to show students how the entire thing works. They get the street view and the satellite view. Once they have a clear, complete picture of what works and how to apply it as shown in each module, they go about putting how-to into action, adding subscribers to their rapidly to growing list. The tech part: I use Teachable.com to host and sell my course. It’s an online course platform or Learning Management System (LMS). I upload my course content and don’t need to worry about the technology and design aspects. Yep, no need to stress over using WordPress and plugins for my course. Teachable hosts the course and processes payments for me. Before I launched it, I knew I needed a good pre-launch strategy. Why prelaunch? Why not go straight to launch? The answer is simple… Most people are hard-pressed to make a decision based solely on a long sales letter written by someone they don’t know. Build 5000-strong email list in a few months? And I am a regular guy with my 9-5 job + family to attend to? Is that even possible? I knew that would be running around in peoples’ heads if all I did was pitch my course. People want to see that a totally ordinary guy like them can do it. Even a small achievement like signing up a few subscribers within a short time frame will boost confidence. If I could get prospects to put together a short list of subscribers, a demonstration of what is possible, I knew I would be able to move them much nearer to the buying phase. I designed a prelaunch plan to do the job. 1 week before I launched, I released a free 3-part lesson plan to show people a simple technique everyone can use to acquire 50 email subscribers in less than 24 hours without using a website. So long as they had a cell phone or a laptop that allowed them access to the Internet, they could follow this technique. When people began to implement my technique, they saw instant results. A lot of folks wrote me saying it was the first time they realized that building a list from scratch was real and possible for them. Most people make it too complicated to themselves. They think they need sophisticated SEO magic to rank their website on Google to sign up email subscribers; or that they need to pay for expensive ads to achieve that. And that’s what put them off from starting their own list building. Once people experienced firsthand that what I share with them works, persuading them to take the next step to buy my course becames so much easier. By the time the free 3-part lesson plan was over, readers had been exposed to one of my techniques. …all without complicated SEO, social media, guest posting, and reddit hacks. 2 days later, I launched. People procrastinate… everyone does, including me. If we can make decision tomorrow, we make it tomorrow. Not today. That’s the reason why most launches see the majority of the sales concentrated in the last few days. To encourage people to make a fast decision instead of waiting, I offered a 15% discount off the full price to anyone who paid for the course within the first 48 hours of the launch. Half of my sales came in within the first 48 hours of the launch. Had I not offered a 48-hour only discount, I believe most of the transactions would have been pushed to the last day of the launch. The bad thing about letting the sales come in at the end of the launch is that not everyone opens their emails on the exact day we want them to. Hectic days, busy job, traveling, there are numerous reasons for people to delay opening their emails. If people have no incentive to take action at the soonest possible moment, and if they don’t see our last few reminder emails at the last push, we lose sales. I wanted to get the sales in as early as possible; offering an incentive for people to take fast action did the job for me. After the initial boost, I sent out a couple more pitch emails plus a couple of reminder emails on the closing days. Since this was my first product launch to Growthtext readers, I wanted to find out from those who didn’t buy what stopped them from buying. If I knew the reasons why people didn’t buy, I could improve on those things to do better in the next launch. After the launch the closed, I sent an email only to those who opened my emails during my launch BUT didn’t buy. Those are folks who showed an interest on the course, but for some reason didn’t pull the trigger. I shot them a simple email. In my email I began by thanking them for reading my launch emails and told them I noticed they didn’t enroll in the course. I said that if they could tell me why they hadn’t purchased, I could do better the next time the course was launched. Most people told me they could easily see the value of the course to help them grow their email list and business; the challenge was coming up with the $399 one-time payment. It was an obstacle they could not overcome. What if I made affordable monthly payments available to those who haven’t taken action, but believe the course will help them? What will happen? Will I get a lot more sign ups? Or just a couple of them? The best way to find out? Test it. 2 days later, I sent out an email. I offered a new payment plan for the course: A $39 x 12 months plan. Though the total sum is 17% more vs those who pay for the one-time plan, this monthly payment option released the pressure of having to chunk out a hundreds of dollars at one time to get started. And I set a time limit for this offer: 48 hours. 14 people took up the offer; each paying $39/month for the next 12 months. At the end of the 12 months period, the total sum = $6552. Adding the $5,617 sales I made during the launch period, total sales came to $12,169. By adding a low monthly payment plan, I added an extra 116% to my sales which I wouldn’t have seen had I not made the payment plan offer. That was my first product launch using this blog, and I have learned a lot in the process and enjoyed it. Will I do the same the next time around? I’m not sure, maybe I will or maybe I will test some other things see if I can make improvements. Now that the launch is over and I have the numbers, I have a clear picture how much money a list subscriber is worth to me for a product launch. I launched my course to 6000 email subscribers and made around $12,000. That gave me a value of $2 per email subscriber for a launch. To multiply my revenue for my next launch, I’ll just have to multiply my list. 2x my list = $24,000 launch revenue. 4x my list = $48,000 launch revenue. 6x my list = $72,000 launch revenue. Though the numbers may not be exactly as estimated, that gives me a good picture of what I can expect to gain while I grow Growthtext and its email subscribers. Start a blog, write good posts, grow a list, then create a good product to help people to make changes in their business. I love this awesome model, it’s so awesome…especially while I do it as a side project. I am into like 3400 words into this giant post already; I hope you have learned something from my first launch experience. If you enjoyed this post, please recommend and share it! Feel free to leave a comment below. Glad you found it helpful, Martin. Well done Verena thanks for sharing your experiment with us. Thanks for the response, looking forward to your email.